Coming up with this Top 10 Penang Food list was difficult, because I liked most of the food I tried. Not everyone has a stomach like mine, and not everyone has the luxury of time (you will need at least 1 week) to indulge in ALL that Penang has to offer. If you’re blessed with a bottomless pit, click here. Otherwise, check out the list below. Some people swear by this roti canai while others swear at the stall’s poor hygiene. I didn’t think much about the roti canai and the place could be cleaner, but the curries!! My oh my, they pack a wallop of flavour. The curries are thick, richly spiced and aromatic. I also love how the meats are cooked till tender, especially the beef. 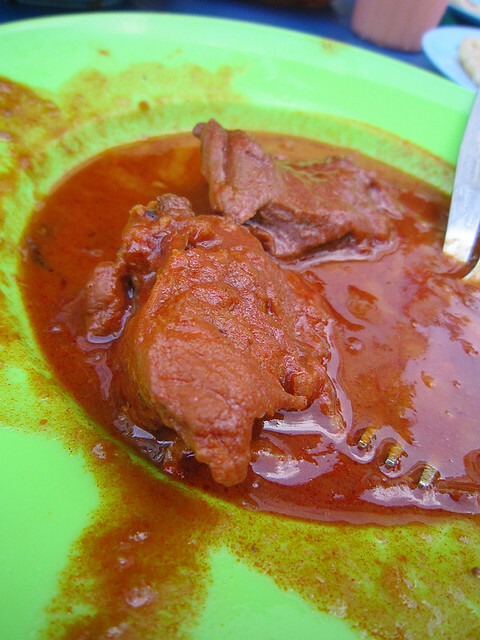 Do order all three curries – chicken, beef and mutton – for comparison. And also because combining the three gravies makes the overall flavour so much better! Read my blog post on Transfer Road Roti Canai here. This is still the best tasting Asam Laksa in Penang. The soup is thick, flavourful and spicy, with a good texture from the shredded fish. I love how the pungent-sweet shrimp paste adds “oomph” to the asam laksa. The best way to have it is with less noodles, extra vegetables. My regular order is two bowls and that will make me sweat buckets. Read my blog post on Air Itam Asam Laksa here. So far, Hameed Pata Mee Goreng is the best Mee Goreng I’ve tried in Penang. The noodles are cooked with red sauce and spicy sotong. 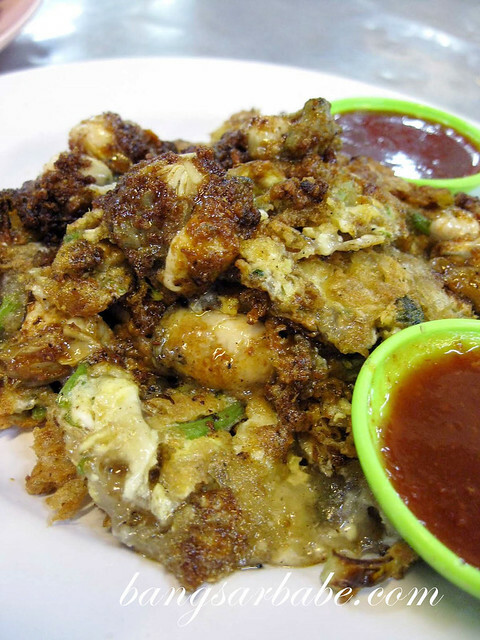 The sotong is tasty from the savoury-sweet gravy and if you can’t take spicy, it’s best to have a cold drink on standby. Read my blog post on Hameed Pata Mee Goreng here. 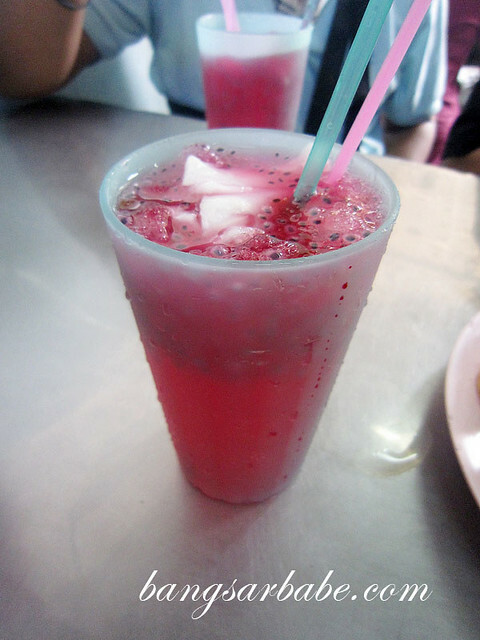 Ais Tingkap is a rose coloured drink containing coconut flesh and basil seeds (biji selasih). Preparation involves a number of steps: The guy fills the glass with shaved ice, sugar syrup, getah anggur, rose essence and basil seeds. Then he sprays a mixture of Indian herbs, adds coconut water, coconut flesh and tops the glass with more shaved ice.The end result is a very refreshing and aromatic thirst quencher with a bit of texture from the basil seed and coconut flesh. Read my blog post on Ais Tingkap here. Hands down the most popular cendol place in Penang, there is a perpetual queue for this sweet fix. But you don’t have to wait long for your cendol. Alternatively, you can order your cendol from Joo Hooi Café and pay an extra RM0.30, or walk 200 metres down the road to a cosy café where you can have your cendol fix without paying extra. The pandan jelly noodles are firm and the coconut milk used is fresh and aromatic. The palm sugar used has thick texture and a smoky aroma, giving the cendol a fuller flavour. Read my blog post on Penang Road Teochew Cendol here. Currently my favourite char kuay teow place in Penang, Ah Leng makes a mean plate of this Penang delight. You can opt to have a normal plate of char kuay teow for RM6, or the special char kuay teow which comes with mantis prawns for RM10. A special plate comes with 4-5 large prawns and a few pieces of mantis prawns. The kuay teow boasts a good dose of wok hei, and the duck egg and mantis prawn impart a rich, creamy flavour to the noodles. 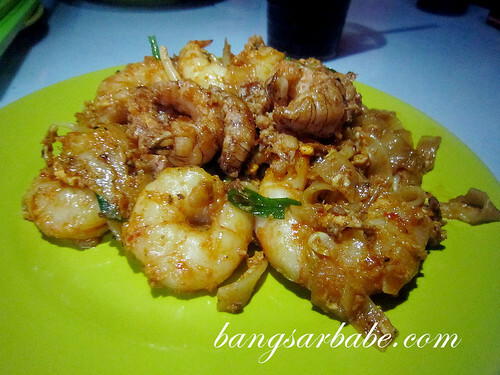 Read my blog post on Ah Leng Char Kuay Teow here. 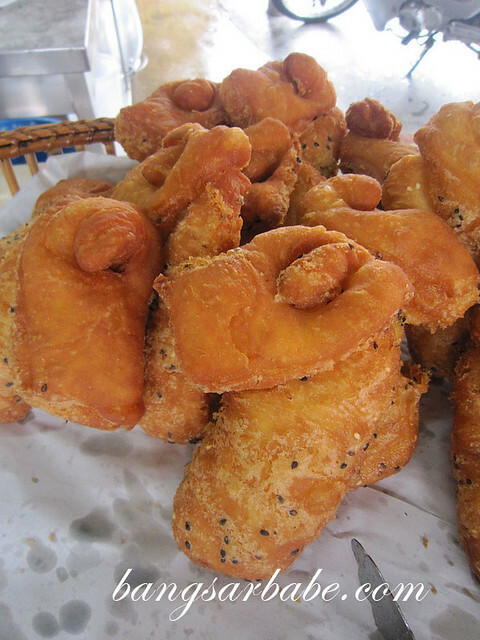 Te Chang You Tiao Wang is known for its fried cruller, but I like the ma keok (black and white sesame twins) better. This crunchy treat has a bread-like consistency at the centre, and is mildly sweet. Priced at RM2 for three pieces, I find it pretty good value for money. Read my blog post on Te Chang You Tiao Wang here. The Oh Chien at Bee San in Air Itam is by far the best I’ve eaten in Penang. I know many Penangites like the oh chien at Seng Thor, but this one is my personal favourite. 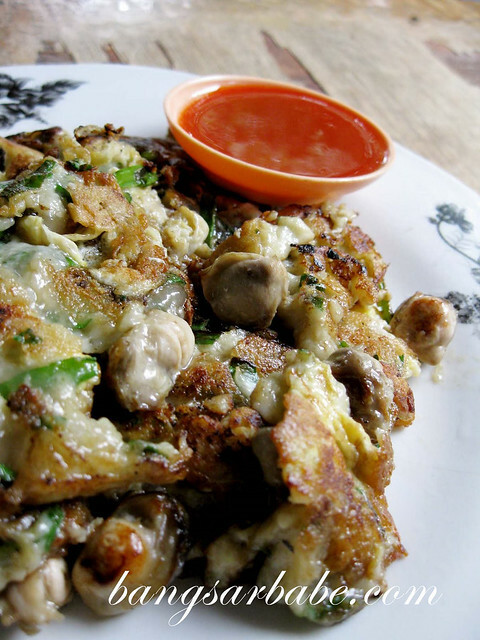 The egg batter is cooked withlarge oysters and chopped spring onions, and boasts a crisp exterior and soft centre. Also good is the Pei Pa Duck which runs out by 7 or 8pm. 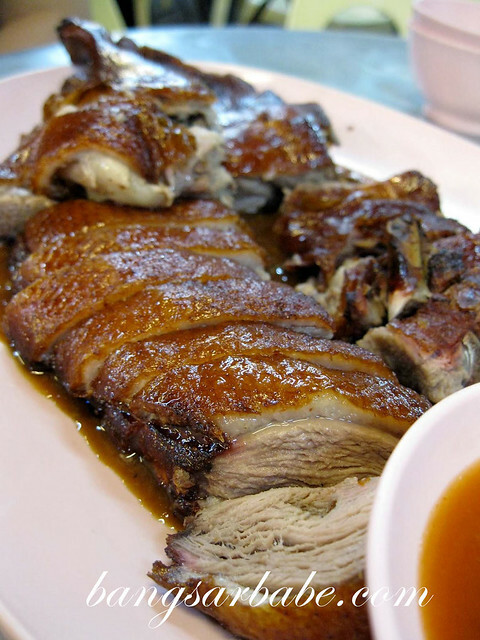 The duck is deep fried before being served, so the skin is extra crispy. Eat it with the accompanying sauce – savoury and sweet with a hint of peanut, shallots and garlic. Read my blog post on Kedai Kopi Bee San here. My friend Tommy recommended this place to me a few years back. Get there before the lunch crowd kicks in, or you might have to wait for more than 30 minutes for your food. 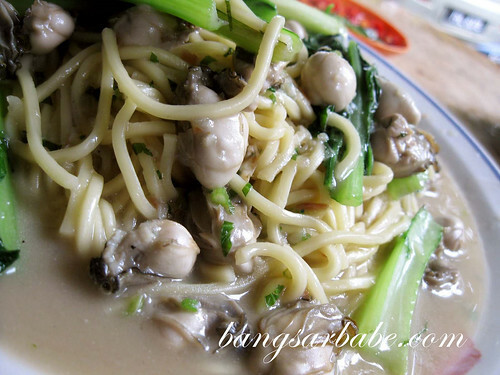 The oh mee (oyster noodles) is the highlight here – the gravy is sweet from the oysters and noodles have wok hei. This is also a place where you can find Bak Kee soup, comprising fried pork slices and broth, flavoured with vegetables. The Oh Chien is quite decent, but order this when you’re dining in a larger group. Read my blog post on Hock Chuan Heong here. My regular breakfast place in Penang, I like eating the Ark Thooi Mee Suah (duck mee suah) here. 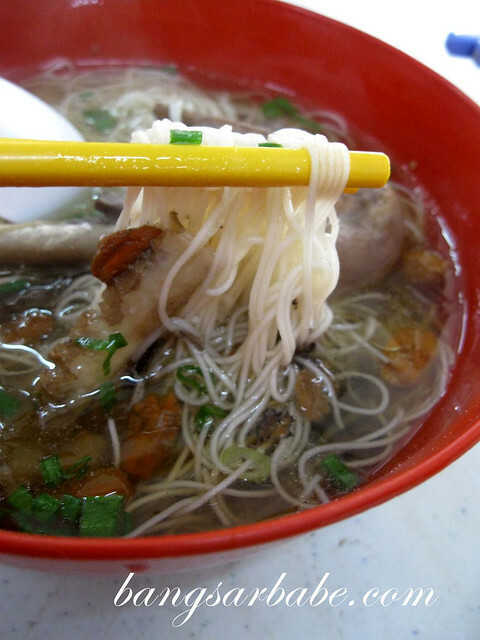 A bowl comes with a whole duck leg and noodles in double boiled herbal soup. What I love about this mee suah is its texture – firm and smooth – and the strong herbal flavour of the soup complements it well. You can also try the Penang curry mee and chee cheong fun here, although, the one from Air Itam and Macalister Road is still tastier. But for overall convenience and variety, I’d still pick this place for breakfast. Read my blog post on Kedai Kopi Kwai Lock here. 295B, Jalan Burmah, Penang (opposite Pulau Tikus police station). 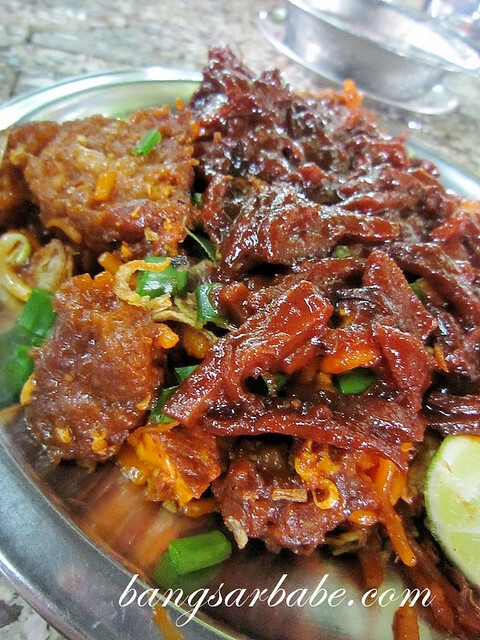 And that wraps up my Top 10 Food to Eat in Penang list. Again, this list is made with consideration of those who are pressed for time and stomach space in Penang and based on my personal taste. If you discover other good places, do share them with me so I can visit those places when I make my way up north soon! Looking at all this makes me so hungry! I have some foods and places to check out next time I’m in Penang. I’ve only had the angry aunty Char Kway teow, so must try Ah Leng. So many yummy things in your post to try! Going to Penang tomorrow! Will let u know if I try any of the above! 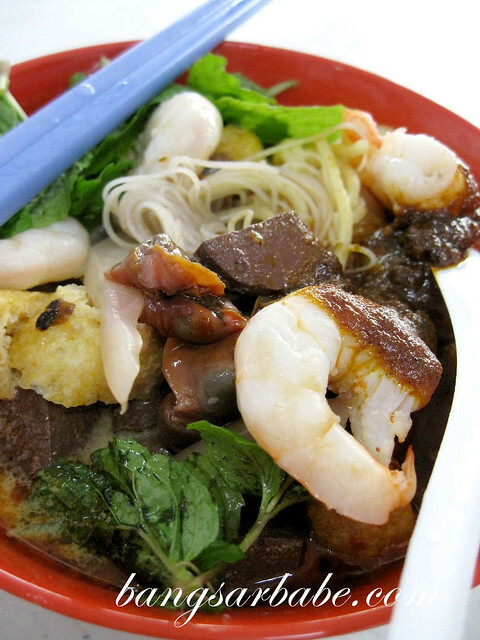 Am definitely going to Kwai Lock for the chee cheong fun, curry mee & sar hor fun. There is also a famous ban chan koay outside the coffeeshop that u have to try! Thanks for sharing your list. Sure! Will let you know if I head to Singapore again. Not sure when as I’ve been swamped with work. Thanks for the tip! Will def head to Ah Leng @ Air Itam next time. I intend to go back to Penang v soon for my next food trip and hopefully squeeze in Ipoh. When i was in Ipoh, Thean Chun (which u had reviewed was closed), it’s competitor next door was also closed (found out from the coffee shop assistant that the boss just had an operation and wasn’t sure when he wil be back!). So i wasn’t able to try the best hor fun in ipoh. P.S: Am hoping u do a top 10 food list for Ipoh. Penang here I come. Thank you for the information. Air Itam assam laksa – his daughter opened a stall at Asia Cafe, Subang. Stall opens at 3 pm on weekdays, 1 pm on weekends. Easy to recognise the stall, his picture is on the banners. I’m planning for a trip to Penang with a group of 5 and I would like to visit some of the places that you’ve mentioned like Sin Hwa, De Tai Tong, Air Itam Assam Laksa, Cendol (will visit this with Lorong Selamat Char Kueh Teow) , Ah Leng Char Kueh Teow and Bee San. Can you tell me which of these places are close to each other so that I can plan my trip better? I’ll be staying in Tanjung Bungah. My email is [email protected]. Your help is greatly appreciated! Can’t wait to taste all these good food! The Oh Chien looks so yummy.. I called it “Oh Luak” in tio ciu language (my family language).. I think i should try when i visit Penang. Reading your blog makes me drool over all the food that you have posted. I am just wondering is the chinese food in Penang consider halal too?. miss penang’s foods… hvnt try chee chong fun yet, will try it next time… does anyone know where i can buy popiah at penang? Thanks for all the info! Going to penang for two days.Cant wait to taste all the food there!!! I’d love how you introduced the food with gps coordinate, that makes everything goes easier! anyway, the food looks really YUMMY! Just came back from Penang. Tried fish noodle soup at Wah Pin Coffee Shop near Nyonya Heritage Mansion, Church Street. It’s good and price reasonable. Had to wait for the food, as it was lunch period. The in-house coffee also good.